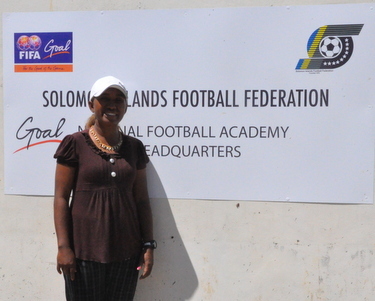 This particular engagement furthers the resume of Justus who is considered to be among the elite women coaches in the Oceania region. The 28 year old holds an OFC D-Licence instructor’s certificate amongst others and has extensive experience working as a technical person inside the country. This is the second time for Justus to be called up for international duty with FIFA. Her first call came in 2010 when she was asked to be a member of the FIFA technical study group for the Youth Olympics held in Singapore. From there Justus has built a solid profile that has led to this second appointment from FIFA. Justus is quietly satisfied with the appointment and says that she views this as an opportunity to learn. “Working at the FIFA level even for such assignments requires a lot of dedication and concentration. For me this is a step up from my last outing and I hope to learn more and build my confidence in this important aspect of football,” Justus says. In Japan Justus will join up with a colleague from Japan in the city of Hiroshima where group D of the competition will be based. In Hiroshima Justus will work on 4 matches; Ghana v USA and Germany v China on August 20 and Ghana v Germany and USA v China on August 23. From Hiroshima Justus will travel to Tokyo and administer in 2 more matches before returning home on August 30. Her 2 matches in Tokyo are Republic of Korea v Brazil and Switzerland v Japan on August 26. Her main task is concerned with gathering technical data from the matches. This data is supplied to analysts who prepare the technical reports for the competitions. Technical study groups are implemented for all FIFA competitions.